As you will notice in the synopsis above, not much is given away regarding this story. You are warned not to assume anything, which instantly piques your interest. You're told to "get ready for the read of your life". How can a book lover resist?! Well, if you enjoy a good, twisty mystery, then resistance is unnecessary as The Wife Between Us will give you much to enjoy when reading. Because of the many twists and turns within this story it's nearly impossible to tell you much of anything without possibly giving away clues that could ruin some of those revelations. I will tell you that the main character is a recently divorced woman who, for reasons you will discover, cannot stop thinking about her ex-husband or his soon-to-be new wife. That's about all I can say (see, told you I couldn't say much). From that one nugget of information these two authors spin a complicated web of obsession, betrayal, pain, and revenge that would be nearly impossible to fully guess when starting. I will admit that I did guess one of the bigger revelations pretty early on, however I still enjoyed seeing how that revelation would come to pass as well as seeing how the many other surprises would unfold. There were a few instances of those awesome moments when I stopped and said "oh wow, THAT'S what was happening there!". I love when that happens and it happened quite often when reading The Wife Between Us. Something else I quite enjoyed about the story was the fact that the writing flowed seamlessly even though there were two separate authors writing it. I cannot determine which author wrote which portions, which is great and always surprising to me in these sorts of situations. I've been a fan of Sarah Pekkanen's writing for a long time now and I'm so excited that I've discovered a new novelist to follow in Greer Hendricks! The Wife Between Us is full of complicated characters, none of which are who they appear to be initially. There are so many dropped clues throughout the story and hanging threads of narrative that all come together and make sense by the end. The wrap-up feels neat and ordered, which I love as I hate when there are still tons of questions left unanswered at the end of the story. While I will say that there are sections of the story that dragged somewhat, making the pacing not quite as "thrilling" as I would have liked, overall this is a great mystery that will appeal to a wide range of readers interested in complicated characters and well thought out and developed plots. I think it's pretty cool! If you sort of squint at the two faces they kind of look like they're melding into one, which is a great representation of how you feel when reading the book...everything seems to meld/shift/twist together. The brighter yellow letters also make the title stand out, which I love. Nice contemporary cover. 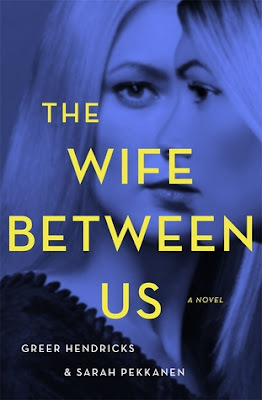 I won an ARC (Advanced Reader Copy) of The Wife Between Us from Shelf Awareness...thank you Shelf Awareness and St. Martin's Press for my copy! All opinions are mine alone. To find more information about the book, including other reviews and links to where you can purchase a copy, see Goodreads HERE. I read this book, too, and I won't spoil it, either. If you, like me, dislike romance novels or even romantic thrillers, I promise, THE WIFE BETWEEN US is neither. Although it does describe a love triangle, it doesn't exactly. It seems the ex-wife is stalking and terrorizing the girlfriend, but then it doesn't. And it won't seem that you are reading a romance novel. I, too, won an ARC of this book from St. Martin's Press. Perfectly said, techeditor! I'm not a fan of heavy romance in novels either, and this definitely isn't that :)! Happy New Year! I am intrigued by this book, have been seeing lots of good reviews. I was curious about it having two authors and happy to see you thought that was pretty seamless. Happy New Year!! Yes, the two authors did an excellent and seamless job of incorporating their two voices. I hope you enjoy it if you read it! First Book of the Year + 3rd Blogiversary! !